Spinach dip made even more healthy with real ingredients -- no preservatives or artificial flavorings. This clean eating spinach dip is made from scratch with nutritious foods. Spinach dip sounds like a healthy appetizer, right? We all know that spinach is healthy. But if you look carefully at the ingredients in the traditional recipe, you will realize that the chemicals in that packet of vegetable soup mix and mayonaise are not at all healthy. However, spinach dip can easily be remade into a clean eating version with no processed foods. As a bonus, using fresh vegetables in the dip increases the nutrients and fiber while adding fresh flavors. Frozen spinach still retains most of the nutrients of fresh spinach, so don't worry about using it in this recipe. In fact, frozen spinach often has more vitamin C than its fresh counterpart. Thaw the spinach in a small colander so the water can drain out. Then press it to get the remaining moisture out. I like to use a bowl that fits inside of my colander to push on the spinach. Wash and cut the bell pepper and green onions. For this tutorial, I used yellow and orange peppers. But you can use any color you have on hand. Bell peppers are full of nutrition! Put the vegetables into a food processor. I use the Ninja Chopper. Pulse it until it becomes a fine mince. See the photo for what it looks like. Put the pureed vegetables into a mixing bowl and add the fresh minced garlic. If you are used to a clean eating lifestyle, the sharp flavors of raw onion, garlic, and pepper are probably delightful to you. But if you are new to eating fresh vegetables, you may find the onion and pepper flavor too powerful. Certainly the traditional spinach dip recipe has a more mellow onion flavor because it uses onion powder instead of fresh onions. The solution is to simply saute the vegetables (before you puree them) in a small amount of olive oil. Cooking them will mellow the flavors. For my recipe, I use yogurt instead of the mayonnaise normally called for. The texture is closer to mayonnaise than sour cream, but you could simply double the amount of sour cream. You can also use homemade mayo. At any rate, you need a full cup of dairy -- sour cream, yogurt, mayonnaise, or a mixture. Mix the vegetables, dairy products, and spices together in a mixing bowl. This recipe will probably need more salt that is called for, so do several taste tests to get it right. The soup mix in the traditional recipe is mostly salt, so it's not surprising that you want to add a lot of salt to this healthy makeover. 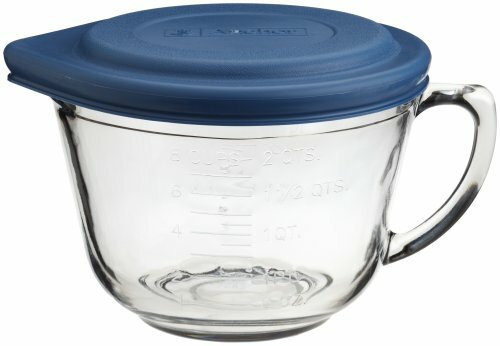 Add no more than a teaspoon at a time, stir, and taste. Remember that the flavor will improve as the dip sits, so try to plan to make this spinach dip at least 4 hours and up to 24 hours before you want to eat it. Stir it again and do more taste testing right before eating it. You may find it needs even more salt or some other favorite spice. Are You Willing to Try Clean Eating Spinach Dip? Would you try this clean eating recipe for the sake of health? Yes, for the sake of health, I am willing to try a new taste in spinach dip. Maybe I would be willing if it is pretty close to the original. No, I am sticking with the old fashioned (chemical laden) version of spinach dip. If carbs are not a concern, serve clean eating spinach dip with crackers or tortilla chips. Love sausage balls but hate the nitrates in sausage and the weird fats in processed baking mixes? Make sausage balls the healthy clean eating way with this recipe and tutorial. This delicious gelatin salad is made with fresh cranberries, canned pineapple, celery, and nuts. It is more like a relish than a typical congealed salad. 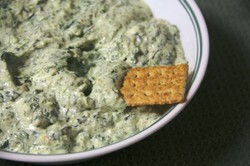 I really love spinach but if I made your Spinach Dip, I would probably eat all of it which wouldn't be quite so healthy! Dustytoes, Yes, I love my Ninja. 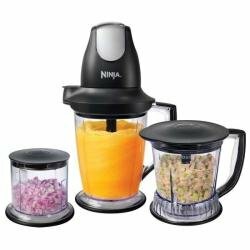 Because it works as both blender and food processor, it's a favorite. 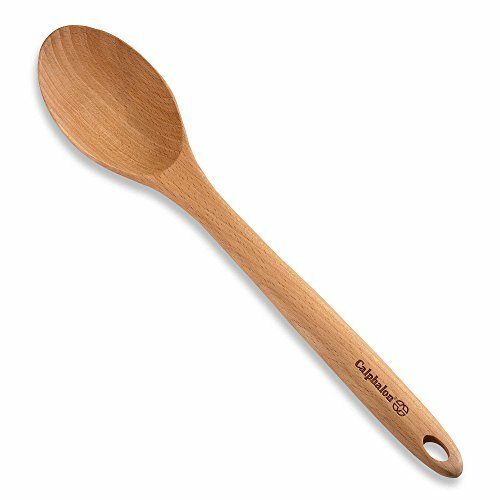 I like keeping kitchen tools simple and not having a gadget for every single process. But my Ninja is a keeper -- an absolute necessity. I don't have parties much, but I could eat this clean spinach dip myself as a meal - (well not the whole thing)! I need a food processor too... you like yours? Oh my goodness - All these delicious food hubs. I'm going to make this and the sausage balls for New Year's Eve. I also think this will be great all summer long - as a way to use all of those garden vegetables. The spices sound delicious as well!